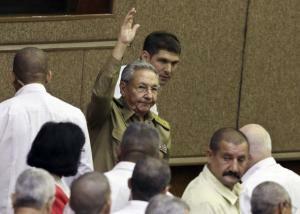 Cuba’s President Raul Castro waves to the crowd during a ceremony in Havana February 24, 2015. (Reuters) – Cuba would agree to restore diplomatic relations with the United States in time for the April Summit of the Americas if Washington quickly and convincingly removes the Caribbean country from a list of state sponsors of terrorism, a senior Cuban official said on Wednesday. Diplomatic ties were severed in 1961, and negotiators for the two longtime adversaries will meet in Washington on Friday, following up on the first round of talks held in Havana last month. If the sides move fast enough, they could reopen embassies in each other’s capitals in time for the April 10-11 summit in Panama, where U.S. President Barack Obama and Cuban President Raul Castro could meet for the first time since agreeing on Dec. 17 to restore ties and exchange prisoners. A senior Cuban official put the onus on Washington to first strike Cuba from the terrorism list, which can apply sanctions to banks doing business with the designated countries. In Washington, a senior U.S. State Department official said re-establishing diplomatic relations should not be tied to Cuba’s place on the terrorist list. If Cuba insists on linking them, it could delay restoring ties, the official suggested. The official said a State Department review about whether to remove Cuba from the list will be completed “very soon,” in weeks at most. “But we don’t think that should be linked to the restoration of diplomatic relations,” said the official, briefing reporters on condition of anonymity. Obama would need to inform Congress of any decision to remove Cuba from the list, a notification that requires 45 days to become official, which is not enough time before the summit. The American side has said Obama’s notification alone should be sufficient because Congress cannot overturn the president under current law. “I cannot say today, right now, if the act of making the announcement would be a sufficient guarantee,” Machin said. U.S. officials have shown a willingness to expedite the six-month review process and remove Cuba before the summit. Cuba was added in 1982, when it aided guerrilla movements during the Cold War. The United States is insisting that as part of any accord, its diplomats have freedom to travel around Cuba and meet with a variety of Cubans, including dissidents. The senior State Department official acknowledged it has been challenging to find a bank willing to handle diplomatic accounts in Washington for Cuba, which remains under a variety of U.S. sanctions. “Both of us have to come to the table in the spirit of getting to an agreement on these things, and not putting so many obstacles in the way that are not linked directly to how we function as diplomats in each others countries,” the official said.